Lived c. 1630 – c. 1710. Hennig Brand discovered phosphorus, becoming the first named person in history to discover a chemical element. Little is known about Brand’s life. Born in about 1630, he was associated with the German port city of Hamburg. Brand did not understand Latin, therefore he was probably not college educated. In his late teens, Brand served as a soldier, perhaps a junior officer, in the 30 Years’ War (fought 1618–1648). This was a ruinous war in which millions died. It resulted from Ferdinand II’s desire, as Holy Roman Emperor, to impose Roman Catholicism on Germany’s Protestant northern states. Earned money as a physician, calling himself Doctor, and adding M. D. behind his signature, although he had no recognized qualifications in medicine. Married a wealthy wife, whose sizable dowry enabled him to fund his alchemical research. Married a second wealthy wife, Margaretha, after the death of his first wife. Hennig Brand was obsessed with discovering the philosopher’s stone. Alternatively known as the elixir of life, the philosopher’s stone promised its finder eternal life and the ability to turn common metals into gold. Brand grew to believe that human urine offered a gateway to the elixir of life. This was typical alchemical thinking – alchemists hoped to better understand eternal life through studying the properties of body fluids. Brand collected thousands of liters of urine from his neighbors. Although someone doing this today would probably be regarded as screwy, it was a common practice to collect urine in earlier times – it had plenty of uses, such as fertilizing crops, softening leather, and cleaning your teeth! At first Brand called the remarkable new substance ‘cold fire’ because it glowed in the dark. He then named it phosphorus, which is Greek for ‘bringer of light.’ He was the first named person in history to discover a new chemical element. The image at the top of this page was painted long after Brand’s lifetime by the British artist Joseph Wright in 1771. Its wordy title is: The Alchymist, in Search of the Philosopher’s Stone, Discovers Phosphorus, and prays for the successful Conclusion of his operation, as was the custom of the Ancient Chymical Astrologers. The painting shows white phosphorus glowing with exaggerated intensity. White phosphorus naturally produces a rather dim green glow. White phosphorus glowing in the dark. Image courtesy Endimion17. Like all alchemists, Brand guarded his methods carefully. 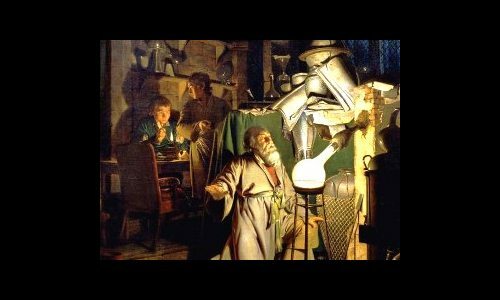 However, he was paid to share his secret method of making phosphorus by Johann Daniel Kraft & Kunckel von Lowenstern, and then Gottfried Leibniz, the eminent mathematician and philosopher. Leibniz believed phosphorus might enable him to discover the philosopher’s stone. Brand married twice and is known to have had a large family to support. A letter exists from Brand to Gottfried Leibniz written in 1698.
Letters exist to Leibniz mentioning Brand in 1699. Leibniz indicates that in 1710, as far as he knew, Brand was still living, because he had not heard of his death. If Brand were alive in 1710, he would have been about 80 years old. "Hennig Brand." Famous Scientists. famousscientists.org. 24 May. 2018. Web. 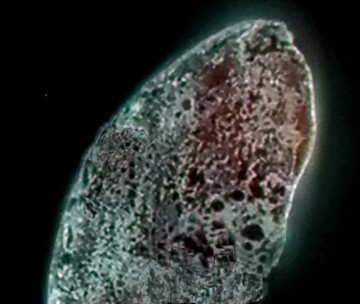 Image of white phosphorus courtesy Endimion17 under the Creative Commons Attribution-Share Alike 3.0 Unported license.